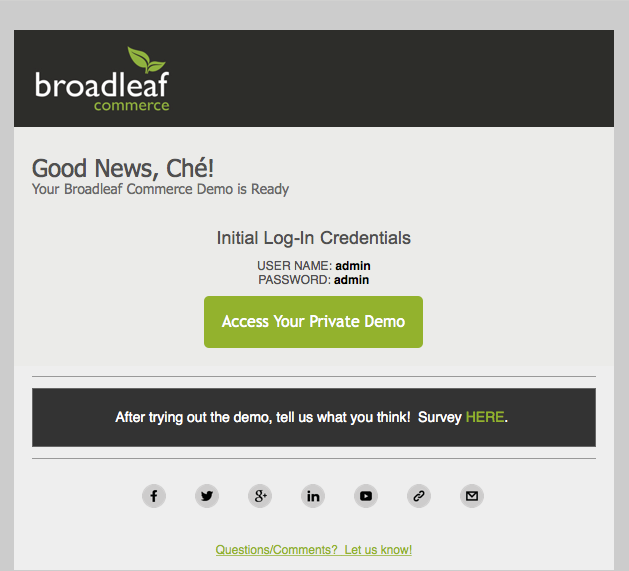 Welcome to the guided tour of Broadleafs v4.0 Admin Tool! 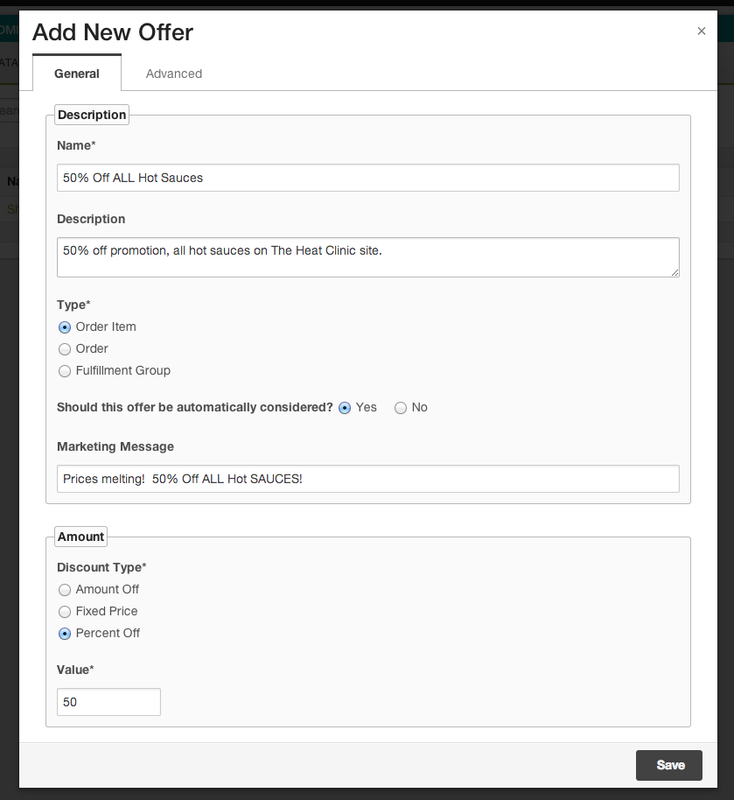 This walkthrough provides a launching point for exploring use case scenarios within Broadleafs red-hot hoppin eCommerce retail demo environment, The Heat Clinic! Keep in mind that while already feature-rich, every component of Broadleaf remains fully customizable. Need integrations? Need more field boxes? Need an added functionality that is not readily apparent? No problem. Every Broadleaf solution launched is customized to fit our clients needs. If you would prefer to view a demo in action, check out our YouTube channel. Build your platform around your business, not the other way around. Typically within 30 seconds your private demo environment will reach the email address provided. Access to your Private Demo will be sent to the email address you provided. 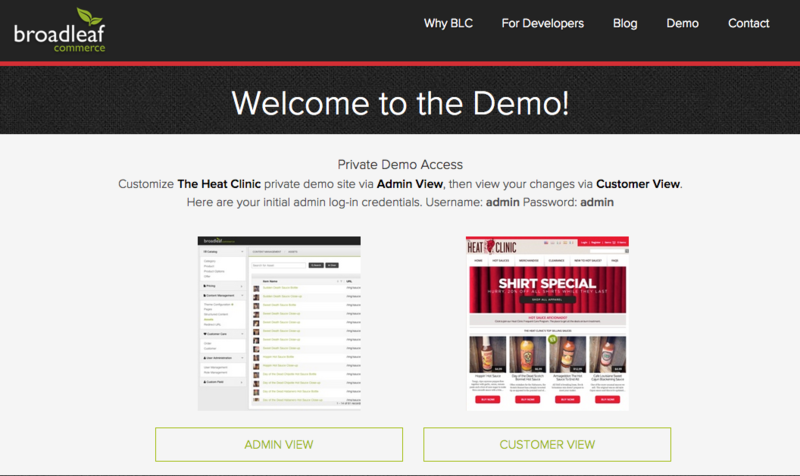 Within the email, click the  Access Your Private Demo button. 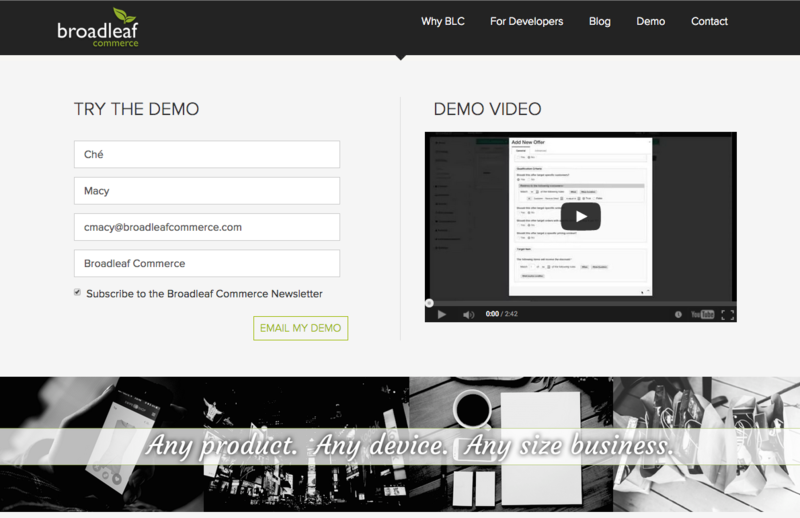 Your Private Demo environment will provision, and you will be brought to a landing page specific to your demo. Feel free to bookmark this page for future use - as new versions of Broadleaf roll out, your demo environment will be automatically updated. Step 3: Welcome to The Heat Clinic! On the landing page, youll notice Admin View and Customer View buttons  I recommend opening  Admin View in a new tab. 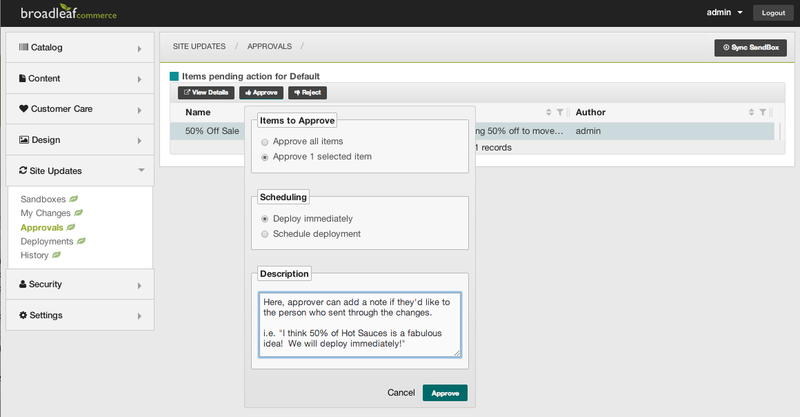 Changes made in the Admin Tool will render on the Customer View of the demo. Once in the Admin view tab, log into the Admin Tool with your default login credentials. Here, well take a look at a summary of each grouping of functions under the left Admin Toolbar. 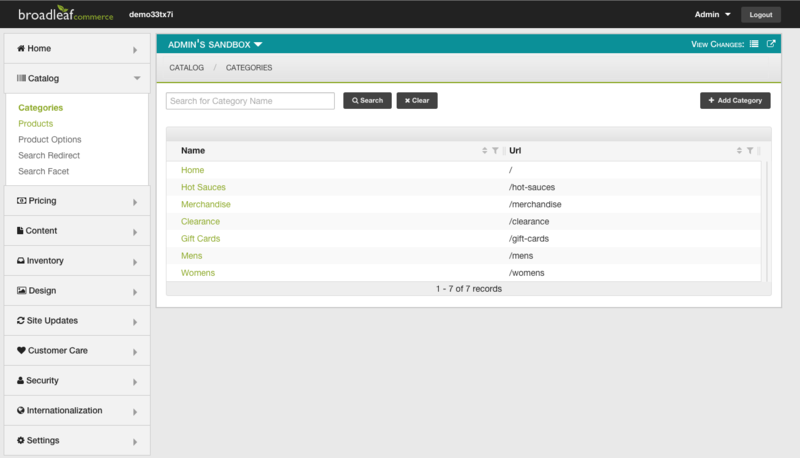 Under Catalog you will see Categories, Products, Product Options, SearchRedirect, and Search Facet. Here you have the option to create and edit categories, products, product options (such as sizes/colors/etc), redirect search keywords, and create a search facet. Under Content you will see Pages, Content Items, Content Targeters, Menus, 'Media Assets', and 'URL Redirects'. Here you can add and edit site navigation tabs, site text, banner ads, image assets, and manipulate URLs. Options under customer care are Customers, Orders, 'Customer Credit' and 'Gift Card Account'. Under customers you can add and edit customer information and include assigned price lists including tax codes if necessary. 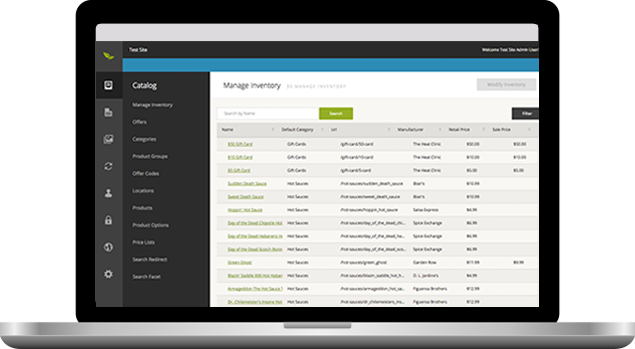 The order management system is in place to help with customer care (CMS). Under the Themes tab, users may manage site themes and templates, including the management of color pallets, images and options. This is the heart of the Workflow and Approval system, containing Sandboxes, Changes, Approvals tab, Deployments, and History. The progression of changes from inception to launch are managed through this section  changes are made in Sandboxes, then passed forward to Changes, then promoted to Approvals. Finally, after changes have launched, they are stored under the Deployments tab. The History tab serves as an archive. Create a team to work within the Admin. Add your team members, assign user roles and permissions for seamless team flow. Have 100 team members, but only want one Admin role to approve, schedule, and launch website changes? No problem. Add modules and create new custom fields to your Admin Tool. The possibilities are endless. Step 5: Enough ChitChat, Time to Explore the Demo! 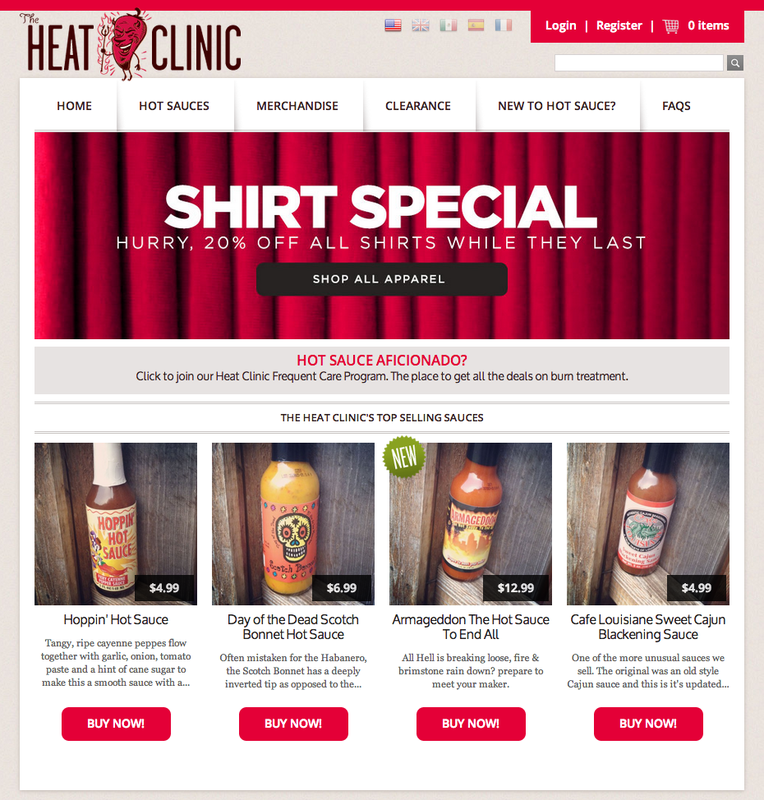 '50% Off' offers are popular, so let's create one for The Heat Clinic's hot sauces! Here, we'll walk through creating a promotion - feel free to take it further by changing the website colors, adding banner ads, changing sauce names - whatever you wish! Add a 'Description' to the offer. This offer will relate to Hot Sauces, so I select 'Order Item' under 'Type'. I would like this offer to be automatically considered. I add a 'Marketing Message', and a 'Percent Off' value. Select the date to start as today if you'd like to start the offer immediately. Time Zone, I'll select CST. I don't want to add a Time Rule for this offer. I don't want to add Qualification - let's keep it open for the masses. "The following items will receive the discount"
Test it out in preview mode. Add a hot sauce of your choice to the cart. For kicks, add something that is not a hot sauce. The marketing message and discount appears in the cart. 6. Ready to Deploy? 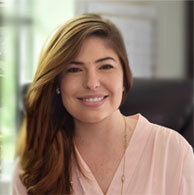 Welcome to Broadleaf Workflow! In your demo, you are the marketing/merchandising team as well as the marketing/merchandising manager (unless you decide to make new users and assign roles to use the demo across multiple users  we encourage this!). A. Submit your sandbox changes to be approved by site administrator/manager. Go to the ' Admin' tab. Click ' Promote', add a note if you'd like (would be seen by management/approver). B. Now it's time to play manager to allow your change to move from the sandbox to deployment. You may also send a note back to the originator of the change... in this case it would be yourself. Step 7: Take Your Site Changes for a Spin! Here, you experience what an actual customer would see if shopping on The Heat Clinic site. Go back to the original landing page for your private demo. 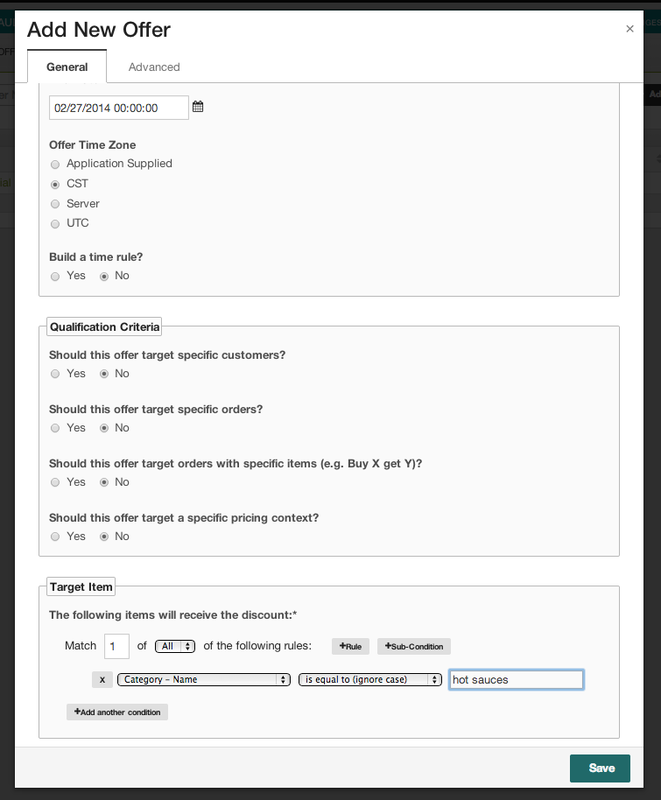 Click ' Customer View' to see your changes in action! At this point, you have completed the formal introduction to the Broadleaf Admin Tool! The possibilities for manipulating The Heat Clinic demo are limitless  if you have an enterprise need for the Broadleaf Platform, would like a 1:1 enterprise demo, or have questions regarding integrations and customization, please feel free to reach out.